including age-specific reference ranges for serum PSA, the ratio of free to total PSA (percent free PSA (%fPSA)), complexed PSA, PSA velocity and PSA density.14–17 In addition, some precursor forms of PSA (p2PSA, for example) have recently demonstrated their potential usefulness in the early detection of prostate cancer.15,18–20 All strategies may significantly reduce false positive results among men with total PSA 2.5–4.0 ng ml1 (ref. 18). Furthermore, previous studies have demonstrated that combinations of PSA, fPSA, and p2PSA in a multivariate model may achieve 41–44% clinical specificity at 90% sensitivity, as compared with individual markers (23% specificity for PSA and 18–33% specificity for %fPSA).19,20 Access Hybritech p2PSA has being investigated for use with Access Hybritech PSA and fPSA to calculate a multivariate index developed by Beckman Coulter (Brea, CA, USA) to determine the individuals’ relative risk of prostate cancer.21–23 Currently, a multicenter clinical study in the United States sponsored by Beckman Coulter suggests that, at 95% sensitivity, this prostate cancer risk index doubled the specificity of prostate cancer detection relative to %fPSA for individuals with PSA 2–10 ng ml1 (ref. 21). Although the index is not currently available for commercial distribution in the United States, an economic evaluation of the index may inform how multiple measures might affect prostate cancer management costs. The present study evaluates the 1-year budget impact to a health plan of adding the index to conventional PSA and fPSA blood tests. Abbreviations: %fPSA, percent free PSA; NA, not apply; PLCO, prostate, lung, colorectal and ovarian; PSA, prostate-specific antigen. a Probability of PSA 2–10 ng ml1 ¼ (probability of PSAX2 ng ml1 )(probability of PSA410 ng ml1); (probability of PSA 4–10 ng ml1) ¼ (probability of PSAX4 ng ml1)(probability of PSA410 ng ml1) b Data were obtained from a simulation study by Beckman Coulter, which is currently under FDA review. 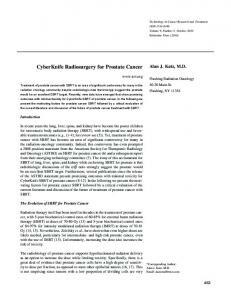 c Probability of prostate cancer in PSA 2–10 ng ml1 ¼ ((Probability of PSAX2 ng ml1) (probability of prostate cancer of PSAX2 ng ml1)(Probability of PSA410 ng ml1) (probability of prostate cancer of PSA 410 ng ml1))/(probability of PSA 2–10 ng ml1). 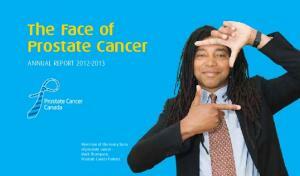 is referred to an urologist, repeats PSA and receives a biopsy for prostate cancer diagnosis. We assumed the PSA test result is the same as the first test. For the %fPSA testing strategy, fPSA is performed as a reflex test, and %fPSA is calculated. For the index strategy, both fPSA and p2PSA are performed as reflex tests and the index score is calculated. Based on the Beckman Coulter simulation study,21a value of o25% for %fPSA or a score higher than 25 for the index corresponds to B30% of weighted average relative risk of prostate cancer.21 These values represent a positive test used for an urologist visit referral and biopsy. Conversely, a %fPSA value of 25% or higher or an index score of 25 or less is considered negative, with no biopsy. Abbreviation: %fPSA, percent free PSA; PSA, prostate-specific antigen. Note: costs data were based on the 2009 Medicare fee schedule. The ranges tested in sensitivity analyses were calculated as decreasing and increasing 25% of base case costs. a The p2PSA test is not currently available for the United States market. Its cost has been estimated from discussions with Beckman Coulter. The cost including p2PSA, fPSA and total PSA is incorporated into the cost of the index. b The biopsy cost was the integrated cost from 12-core prostate biopsy, echographyguided biopsy, transrectal ultrasound, tissue examination by a pathologist and three immunohistochemistry stains. %fPSA testing strategy; (3) one PSA, one fPSA and one p2PSA for the index testing strategy. We assumed that routine urinalysis was performed for positive PSA blood tests. As prostate biopsies involve multiple procedures, costs included 12-core prostate biopsy, echography-guided biopsy, transrectal ultrasound, tissue examination by a pathologist and three immunohistochemistry stains. Probability of prostate cancer detection. Among individuals who had a positive PSA test result, the prostate cancer detection rate upon biopsy was determined from published studies (Table 1). Market share. Base case market share for the PSA strategy was estimated as 90, and 10% for the %fPSA strategy. In the new scenario, we assumed a 10% market share for the index strategy and maintenance of 10% for the %fPSA strategy, and 80% for the PSA strategy. Abbreviations: %fPSA, percent free PSA; PMPM, per-member-per-month; PSA, prostate-specific antigen. a Budget impact was calculated by the total costs of the new scenario minus the total costs of the reference scenario. b Four PSA test results are considered as positive test: (1) PSA 410 ng ml1, (2) PSAX2 ng ml1 for the PSA strategy, (3) PSA at 2–10 ng ml1 and a positive %fPSA test for the %fPSA strategy, (4) PSA at 2–10 ng ml1 and a positive index for the index strategy. c Detected prostate cancer was defined as the true positive PSA test, in which prostate cancer is confirmed via biopsy for the individuals who have a positive PSA test. d Unnecessary biopsy was defined as a biopsy performed due to the false-positive PSA test, in which prostate cancer was not confirmed via biopsy for the individuals who have a positive PSA test. e Total costs per prostate cancer detection was calculated as total costs for prostate cancer screening divided by total number of detected prostate cancers. Note: Costs were presented in 2009 US dollars. Abbreviations: %fPSA, percent free PSA; PMPM, per-member-per-month; PSA, prostate-specific antigen. Note: Costs were presented in 2009 US dollars. a Budget impact was calculated by the total costs of the new scenario minus the total costs of the reference scenario. b Four PSA test results are considered as positive test, (1) PSA 410 ng ml1, (2) PSAX4 ng ml1 for the PSA strategy, (3) PSA at 4 to 10 ng ml1 and a positive %fPSA test for the %fPSA strategy, (4) PSA at 4–10 ng ml1 and a positive index for the index strategy. c Detected prostate cancer was defined as the true positive PSA test, in which prostate cancer is confirmed via biopsy for the individuals who have a positive PSA test. d Unnecessary biopsy was defined as a biopsy performed due to the false positive PSA test, in which prostate cancer was not confirmed via biopsy for the individuals who have a positive PSA test. e Total costs per prostate cancer detection was calculated as total costs for prostate cancer screening divided by total number of detected prostate cancers. biopsy costs according to the assumptions previously defined. Costs are presented as total costs for prostate cancer detection, total costs per prostate cancer case detected and per-member-per-month (PMPM) cost. All costs are expressed in 2009 US dollars. Budget impact is calculated as the difference between the new and reference scenarios for all budget components and total costs. We presented the budget component by PSA test results and by service used. Finally, sensitivity analyses were performed to determine the influence of varied inputs on the total costs. We assumed the health plan perspective for a 1-year horizon. Costs were not discounted due to the short length of the analysis.35 Analyses were repeated for two models of PSA cutoffs (2 and 4 ng ml1) using Microsoft Office Excel 2003, and followed the International Society for Pharmacoeconomics and Outcomes Research (ISPOR) principles of good practice for budget impact analysis.35 The study was approved by the Institutional Review Board of the principal investigator’s institution. Two coauthors from Beckman Coulter participated in study design and manuscript development. Final approval of the manuscript was the responsibility of the corresponding author. Figure 1 Data are presented as the comparison of total costs of prostate cancer detection between the reference and new scenarios by service category. (a) Displays the budget impact in the model with PSA cutoff 2 ng ml1. (b) Displays the budget impact in the model with PSA cutoff 4 ng ml1. PSA, prostate specific antigen. differences significantly (Figure 2). Cost savings decreased when the screening age threshold was reduced to 40 years, the biopsy compliance rate decreased or when p2PSA cost increased. The incremental cost of generating the index could increase to $500 from the base case assumption of $72, yet there would still be cost savings at a PSA threshold of 4 ng ml1. Increasing the market share of the index strategy from 10 to 90% would increase total cost savings from $94 219 (0.08 PMPM) to $847 967 (0.71 PMPM), although this would also require a significant organizational investment for testing. When the index strategy in the new scenario has an equivalent market share of fPSA in the reference scenario, the savings of total cost would be $22 540 (0.02 PMPM) to $45 079 (0.04 PMPM) in PSA cutoff 2 ng ml1 for 10–20% market share, respectively. Figure 2 One-way sensitivity analysis on total healthcare costs difference between the new and reference scenarios. (a) Displays the results for the model with PSA cutoff 2 ng ml1. (b) Displays the results for the model with PSA cutoff 4 ng ml1. fPSA, free PSA; PSA, prostate specific antigen; tPSA, total PSA. smaller in the screening population with lower age threshold, which produced less total screening costs and savings. This analysis has several limitations. First, we have not counted the potential clinical and economic impact from missed diagnoses due to PSA false negative test results, as we assumed that all negative PSA tests were correct. However, the missed cases are usually detected in subsequent screenings.28,36 Second, we modeled prostate cancer detection using biopsy threshold values instead of the probability of prostate cancer risk. Research suggests that the higher levels of PSA are associated with increased risk of cancer.32,43 Although these values are used to determine the need for biopsies, studies have demonstrated that the use of a 4 ng ml1 cutoff was unable to detect all prostate cancers.13,43 Moreover, some cancers detected at very low PSA levels have proven incurable.12 Although there is some evidence that the field is now using a 2 ng ml1 cutoff, lowering the biopsy threshold may increase detection of ‘indolent’ lesions.13,29,30,43–45 Therefore, the 2009 AUA PSA Best Practice Policy3 emphasizes that the prostate biopsy decision should consider PSA and digital rectal examination results, as well as multiple factors. Two recent studies22,23 reported that a mathematical formula combining total PSA, fPSA and p2PSA to calculate the index shows improved specificity for detecting prostate cancer. Jansen et al.22 reported a specificity of 31% for the index at 90% sensitivity, compared with total PSA (10%) and %fPSA (12%). Comprehensive prostate cancer risk calculators have been developed to assess individual risk32,46 of cancer or need for biopsy and follow-up. Although applying a risk score within the budget impact model may have provided a more precise economic evaluation, the lack of available data restricted such an application. In summary, the index shows considerable promise as a complementary approach to current prostate cancer screening strategies as one method for cost reduction. The 1-year budget impact model showed that the increased laboratory costs required for this application resulted in health care cost savings from reductions in physician office visits, and the avoidance of unnecessary biopsy procedures. Future studies should address the impact of the new screening strategy on identifying prostate cancers over multiple years, and the consequent treatment costs and mortality. Conflict of interest Research funding for this study was provided by Beckman Coulter. Dr Michael B Nichol has received research grant from Beckman; Joanne Wu and Jae Jin An have been paid from the research funding from Beckman Coulter in connection with this paper; Joice Huang and Dwight Denham are both employees of Beckman Coulter. Outcomes Research (ISPOR) 15th Annual International Meeting, Atlanta, GA, May 2010. This study was funded by Beckman Coulter. References 1 Jemal A, Siegel R, Ward E, Hao Y, Xu J, Thun MJ. Cancer statistics, 2009. CA Cancer J Clin 2009; 59: 225–249. 2 Stark JR, Mucci L, Rothman KJ, Adami HO. Screening for prostate cancer remains controversial. BMJ 2009; 339: b3601. 3 Greene KL, Albertsen PC, Babaian RJ, Carter HB, Gann PH, Han M et al. 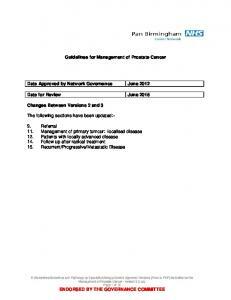 Prostate specific antigen best practice statement: 2009 update. J Urol 2009; 182: 2232–2241. 4 Wolf AM, Wender RC, Etzioni RB, Thompson IM, D’Amico AV, Volk RJ et al. 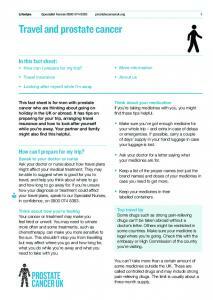 American Cancer Society guidelines for the early detection of cancer: update 2010. Ca Cancer J Clin 2010; 60: 70–98. 5 Bretton PR. Prostate-specific antigen and digital rectal examination in screening for prostate cancer—a community-based study. Southern Med J 1994; 87: 720–723. 6 Muschenheim F, Omarbasha B, Kardjian PM, Mondou EN. Screening for carcinoma of the prostate with prostate specific antigen. Ann Clin Lab Sci 1991; 21: 371–380. 7 Richie JP, Catalona WJ, Ahmann FR, Hudson MA, Scardino PT, Flanigan RC et al. Effect of patient age on early detection of prostate cancer with serum prostate-specific antigen and digital rectal examination. Urology 1993; 42: 365–374. 8 Brawer MK. Prostate-specific antigen: current status. Ca-Cancer J Clin 1999; 49: 264–281. 9 Thompson IM, Ankerst DP, Chi C, Lucia MS, Goodman PJ, Crowley JJ et al. Operating characteristics of prostate-specific antigen in men with an initial PSA level of 3.0 ng/ml or lower. JAMA 2005; 294: 66–70. 10 Nadler RB, Loeb S, Roehl KA, Antenor JA, Eggener S, Catalona WJ. Use of 2.6 Ng/Ml prostate specific antigen prompt for biopsy in men older than 60 years. J Urol 2005; 174: 2154–2157. 11 Makarov DV, Humphreys EB, Mangold LA, Walsh PC, Partin AW, Epstein JI et al. Pathological outcomes and biochemical progression in men with T1c prostate cancer undergoing radical prostatectomy with prostate specific antigen 2.6 to 4.0 vs 4.1 to 6.0 ng/ml. J Urol 2006; 176: 554–558. 12 Lucia MS, Darke AK, Goodman PJ, La Rosa FG, Parnes HL, Ford LG et al. Pathologic characteristics of cancers detected in The Prostate Cancer Prevention Trial: implications for prostate cancer detection and chemoprevention. Cancer Prev Res (Phila Pa) 2008; 1: 167–173. 13 Thompson IM, Ankerst DP. Prostate-specific antigen in the early detection of prostate cancer. CMAJ 2007; 176: 1853–1858. 14 Brawley OW, Ankerst DP, Thompson IM. 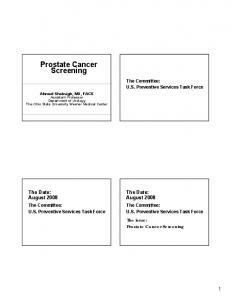 Screening for prostate cancer. CA Cancer J Clin 2009; 59: 264–273. 15 Makarov DV, Loeb S, Getzenberg RH, Partin AW. Biomarkers for prostate cancer. Annu Rev Med 2009; 60: 139–151. 16 Bangma CH, van Schaik RH, Blijenberg BG, Roobol MJ, Lilja H, Stenman UH. On the use of prostate-specific antigen for screening of prostate cancer in European Randomised Study for Screening of Prostate Cancer. Eur J Cancer 2010; 46: 3109–3119. 17 Vickers A, Cronin A, Roobol M, Savage C, Peltola M, Pettersson K et al. Reducing unnecessary biopsy during prostate cancer screening using a four-kallikrein panel: an independent replication. J Clin Oncol 2010; 28: 2493–2498. 18 Sokoll LJ, Chan DW, Mikolajczyk SD, Rittenhouse HG, Evans CL, Linton HJ et al. 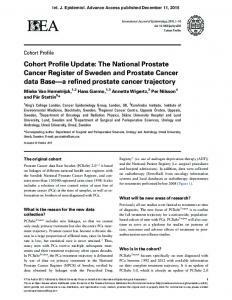 Proenzyme PSA for the early detection of prostate cancer in the 2.5–4.0 ng/ml total PSA range: preliminary analysis. Urology 2003; 61: 274–276. 19 Khan MA, Partin AW, Rittenhouse HG, Mikolajczyk SD, Sokoll LJ, Chan DW et al. Evaluation of proprostate specific antigen for early detection of prostate cancer in men with a total prostate specific antigen range of 4.0 to 10.0 ng/ml. J Urol 2003; 170: 723–726. from the initial screening round of a randomized trial. J Natl Cancer Inst 2005; 97: 433–438. Smith DS, Bullock AD, Catalona WJ. Racial differences in operating characteristics of prostate cancer screening tests. J Urol 1997; 158: 1861–1865. Mauskopf JA, Sullivan SD, Annemans L, Caro J, Mullins CD, Nuijten M et al. Principles of good practice for budget impact analysis: report of the ISPOR Task Force on good research practices—budget impact analysis. Value Health 2007; 10: 336–347. Wolters T, van der Kwast TH, Vissers CJ, Bangma CH, Roobol M, Schro¨der FH et al. False-negative prostate needle biopsies: frequency, histopathologic features, and follow-up. Am J Surg Pathol 2010; 34: 35–43. Hugosson J, Aus G, Lilja H, Lodding P, Pihl CG, Pileblad E. Prostate specific antigen based biennial screening is sufficient to detect almost all prostate cancers while still curable. J Urol 2003; 169: 1720. van der Cruijsen-Koeter IW, van der Kwast TH, Schroder FH. Interval carcinomas in the European Randomized Study of Screening for Prostate Cancer (ERSPC)-Rotterdam. J Natl Cancer Inst 95; 1462: 2003. Hoedemaeker RF, van der Kwast TH, Boer R, de Koning HJ, Roobol M, Vis AN et al. Pathologic features of prostate cancer found at population-based screening with a four-year interval. J Natl Cancer Inst 2001; 93: 1153. Postma R, Roobol M, Schroder FH, van der Kwast TH. Potentially advanced malignancies detected by screening for prostate carcinoma after an interval of 4 years. Cancer 2004; 100: 968. Hugosson J, Aus G, Lilja H, Lodding P, Pihl CG. Results of a randomized, population-based study of biennial screening using serum prostate-specific antigen measurement to detect prostate carcinoma. Cancer 2004; 100: 1397. Schro¨der FH, Bangma CH, Roobol MJ. Is it necessary to detect all prostate cancers in men with serum PSA levels o3.0 ng/ml? A comparison of biopsy results of PCPT and outcome-related information from ERSPC. Eur Urol 2008; 53: 901–908. Thompson IM, Pauler DK, Goodman PJ, Tangen CM, Lucia MS, Parnes HL et al. Prevalence of prostate cancer among men with a prostate-specific antigen level o ¼ 4.0 ng per milliliter. N Engl J Med 2004; 350: 2239–2246. Krumholtz JS, Carvalhal GF, Ramos CG, Smith DS, Thorson P, Yan Y et al. Prostate-specific antigen cutoff of 2.6 ng/ml for prostate cancer screening is associated with favorable pathologic tumor features. 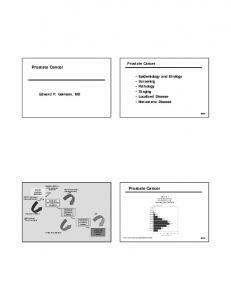 Urology 2002; 60: 469–473 discussion 473–4. Meeks JJ, Loeb S, Helfand BT, Kan D, Smith ND, Catalona WJ. Characteristics of prostate cancers detected at prostate specific antigen levels less than 2.5 ng/ml. J Urol 2009; 181: 2515–2518. Kaplan DJ, Boorjian SA, Ruth K, Egleston BL, Chen DY, Viterbo R et al. Evaluation of the prostate cancer prevention trial risk calculator in a high-risk screening population. Bju Int 2010; 105: 334–337. Report "Budget impact analysis of a new prostate cancer risk index for prostate cancer detection"